Use the Tucker Trimmer II for trimming units at 1/4" and 3/4" increments. We use these for several of our in-house patterns. 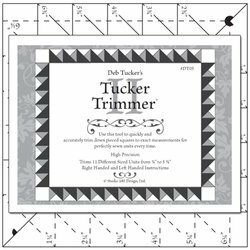 The "Tucker Trimmer II" is a trimming tool from Deb Tucker and Studio 180 Design. Deb's tools are great for increasing both your speed and accuracy as you create your quilts. The Tucker Trimmer II trims units that need to finish at 1/4" or 3/4" increments. You can use this tool to square up units from 1 1/4" all the way up to 5 3/4". Instructions are included for both left- and right-handed quilters, and if you need some visual assistance, Deb has instructional videos on her web site.